The Michigan Accordion Society seeks to advance the knowledge and status of the accordion in our communities. We hold regular membership meetings, sponsor concerts, and provide a network for accordionists to promote their music. Currently there are over 150 members and we are growing monthly. 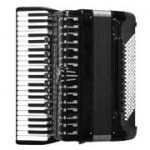 Our first purpose is to promote the Accordion as a beautiful and versatile instrument. It is capable of accompanying music of all types, from classical, jazz, and rock, to the more traditional polkas and folk songs.